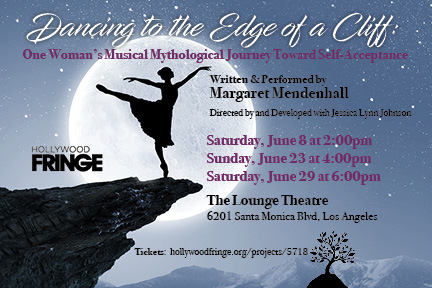 DANCING TO THE EDGE OF A CLIFF: ONE WOMAN’S MUSICAL MYTHOLOGICAL JOURNEY TOWARD SELF–ACCEPTANCE is a one woman show written and performed by Margaret Mendenhall, directed by and developed with Jessica Lynn Johnson. It had its world premiere as an official selection in Whitefire Theatre’s SOLOFEST 2019, the largest solo-show festival on the west coast. Incorporating music, multimedia, humor, a touch of mythology, and embodying over twenty characters, Margaret whimsically puts her psyche on stage to explore her struggle with self-acceptance and her experience of two mental breakdowns. Margaret explores not only what outside influences molded her personality when she was growing up and as an adult, but also confronts two internal voices, representing the competing compulsions of artistry and perfectionism. Realizing in the end that what she has been taught her whole life was right, doesn’t work for her. Margaret Mendenhall (Writer & Performer) has previously performed in children’s theatre and for two years was a member of an improv troupe. This is her first solo show but she also has written an unproduced one act play set on Mars, and hosts and produces the public access television show, Myth Is All Around Us. Last year she earned her Ph.D. in Mythological Studies with Emphasis in Depth Psychology and has presented academic papers at conferences throughout the country on topics such as Star Trek, Game of Thrones, and the representation of feminine energy in the arts, which was the focus of her dissertation. Jessica Lynn Johnson (Director & Developer) is a published playwright, recipient of BEST NATIONAL SOLO ARTIST AWARD, Board Member of the LA Women’s Theatre Festival, Director for Whitefire Theatre’s SOLOFEST, and Founder & CEO of Soaring Solo LLC. Jessica works as a full time Director & Developer of solo theatre having aided in the development of over 75 solo shows (and still going strong)! As a performer, Jessica has edu-tained international audiences touring her own 25 character one person shows ZE and OBLIVIOUS TO EVERYONE for over 13 years. Over the years, Jessica’s projects have taken home awards such as TOP OF FRINGE, HFF ENCORE PRODUCER AWARDS, TVOLUTION BEST SOLO PERFORMANCE, LARRY CORNWALL AWARD FOR MUSICAL EXCELLENCE & several other accolades! Jessica was most recently nominated Female Director of Distinction in Theatre by Girl Trip LLC at the 2018 Hollywood Fringe Festival.